As we age, the skin on the face and neck may begin to sag or loosen. This can cause deep creases to form (typically between the nose and the mouth); it can create a loosing of the skin around the jaw line, and the development of jowls; and it can cause folds and fat deposits to appear around the neck. Face and neck lifts (otherwise known as rhytidectomy and platysmaplasty, respectively) can reverse the effects of aging, gravity, exposure to the sun, and other environmental stressors that can cause these changes in our skin. The procedure for face lifts and neck lifts are very similar. To begin, your surgeon will make incisions along the natural line of the ear. These incisions will curve behind the ear, and into the scalp. The incision line should be concealed within the hairline or within the natural lines of the face and ear. The skin is lifted as the surgeon removes excess skin and fat (sometimes using liposuction), and tightens the underlying muscle and tissue. Next, the surgeon closes the incisions using sutures, and applies medical dressings to protect the incision area. The patient may be put under a combination of local anesthesia, general anesthesia, and/or mild sedatives to help relieve any discomfort during the procedure. The entire procedure can take between 1-3 hours, and is done on an outpatient basis. Bruising following surgery may persist 2-3 weeks. Swelling can last a few weeks or potentially a few months, but will subside enough to go out in public within 7-14 days. Plan on waiting 2-3 months before begin ready for photographs (e.g. wedding pictures, family pictures, etc.). The final results of a face lift or neck lift can take up to one year. The following image gallery depicts pictures of our patients who have received neck and/or face lifts at the American Institute for Plastic Surgery. To see the pictures in better detail, please click on any individual image. If you are interested in undergoing a face lift or neck lift surgery, contact us today. 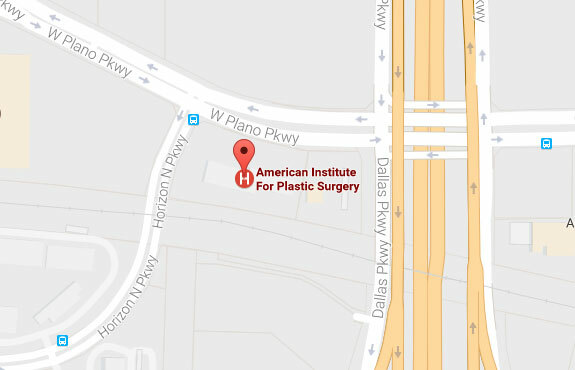 Our facility is located in Plano, but we serve patients throughout Dallas, Texas.